Wolf Cop director Lowell Dean will be headed to Toronto with his latest film Supergrid set to open the 2018 edition of the Blood In the Snow festival. The film anchors an extensive lineup of features, shorts and panels - you can find the full schedule here - for what promises to be both a fan oriented celebration of Canadian genre film as well as a place for emerging talents to interact with and learn from more established voices. Check out the full Supergrid announcement below! TORONTO (November 6, 2018) – Programmers at the 2018 Blood In The Snow film festival in Toronto, Canada have announced their first wave selections and Lowell Dean’s SUPERGRID is set to open the annual genre festival. Directed by Dean (WOLFCOP, ANOTHER WOLFCOP) with the script written by T.R. McCauley and Justin Ludwig, the film premiered at the Calgary International Film Festival. Set in the near future, Lowell Dean’s action adventure follows the story of two estranged brothers (Leo Fafard WOLFCOP and Marshall Williams GLEE) who must travel the notorious “Grid” to collect and deliver a mysterious cargo. Facing off with road pirates and carjackers, they miss their drop-off and unleash a violent showdown with the crime syndicate at Black Lake, the last refuge of hope on the Grid. Fafard and Williams star alongside Natalie Krill (MOLLY’S GAME), Jonathan Cherry (GOON), Tinsel Korey (Z-NATION) and former WWE wrestler Jay 'Christian' Reso. SUPERGRID is produced by Hugh Patterson of Echolands Creative Group and Trinni Franke. "With SUPERGRID I was given a chance to direct a post-apocalypse movie on the prairies with a timely story, lots of action and a killer ensemble cast. It was a challenging shoot but the whole team put their blood and sweat into every frame," said Lowell Dean. 'We couldn't be more excited to have SUPERGRID as our opening night film for the 2018 Blood In The Snow Canadian Film Festival. We have been big fans of director Lowell Dean since doing both of his WOLFCOP films and we love seeing him team up with actors Leo Fafard and Amy Matysio again in such a different way than before. 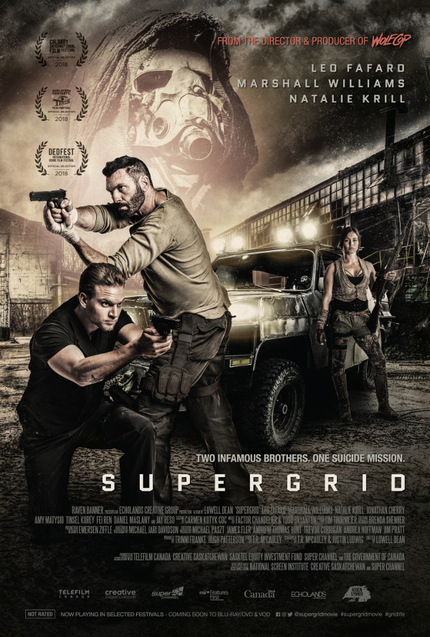 SUPERGRID is that perfect mix of action, sci-fi and clever independent filmmaking that is going to rock BITS 2018," said Kelly Michael Stewart, Blood In The Snow festival director. Distributed in Canada by Raven Banner Entertainment, the film was shot in Saskatchewan and made with the assistance of Telefilm Canada, NSI Features First, Super Channel and Creative Saskatchewan. SUPERGRID opens the 2018 Blood In The Snow film festival at The Royal Cinema, 608 College Street, Toronto on Thursday, November 22 at 9:30pm.